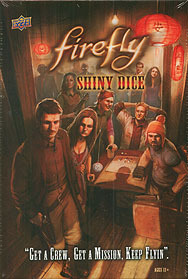 Firefly Shiny Dice is the first and only "Press your luck" style dice game set in the Firefly Universe. Roll up, get a mission and complete as many challenges as you can before your luck runs out. The further you go, the greater the risk but greater the reward if you succeed. Get a Crew, Get a Mission, Keep Flying.